Americanized Mexican food is, like Americanized Chinese food, an ever-popular option for people looking to eat out on a Friday night. For times when you can’t or don’t want to eat out, grocers are more than happy to stock ample supplies to make your own dishes, some of them even branded by restaurants themselves. Aldi keeps a pretty good Mexican-style lineup across its frozen, refrigerated, and dry shelves. The everyday Regular Buy options are solid in and of themselves, but Aldi also rotates in some fun Special Buys from time to time. Salsa is a major part of the Aldi inventory. On the Regular Buy front, Aldi stocks a serviceable, if unspectacular Pace imitation in Casa Mamita Chunky Salsa, along with varied fresh salsas in the refrigerated section. On the Special Buy (ALDI Find) front, we’ve seen both fresh and jarred salsas: we’ve previously reviewed the likes of Specially Selected Mild Mango Peach Salsa and Casa Mamita Chipotle Lime Salsa, and we’ve tasted many of Aldi’s other salsas. Here we take a look at an ALDI Find in a jar. 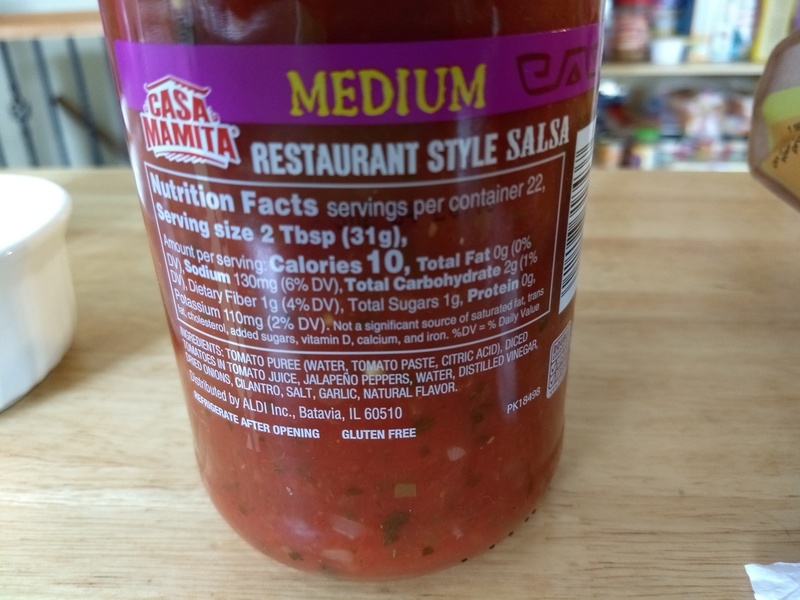 On the outside, it doesn’t look all that different from the Regular Buy Casa Mamita Chunky Salsa … but there definitely is a difference on the inside. We weren’t sure how easily we’d find restaurant taste in a jar, but this stuff comes awfully close, with a mix of flavors, and a texture, that isn’t far off the pace from some of the local restaurants we’ve visited. 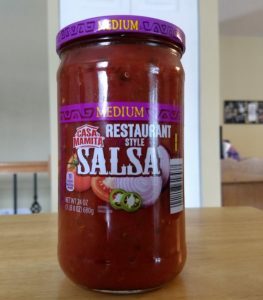 We think it compares favorably to the On the Border jarred salsa, marketed by the restaurant of the same name, that is sold in grocers, and we found the Aldi restaurant salsa to have a more even consistency. We’d like it even more if there were mild and hot versions, too, but all things considered we’re rather impressed. Nutritionally, there aren’t too many surprises. The salsa has ingredients you expect in salsa, and it is low in calories and a bit high in sodium, like most salsas. Nutrition information. Click to enlarge. If the aim of this is to produce a decent imitation of a restaurant salsa, it does the job rather nicely. 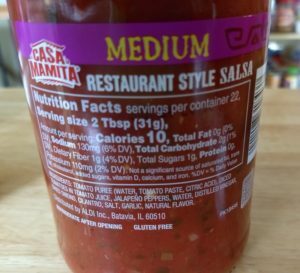 Casa Mamita Restaurant Style Salsa is the real deal, and we think it’s respectable enough to serve at whatever large gatherings you might have. We wish it came in more than just medium heat, and we also wish this was a year-round product rather than a limited-stock ALDI Find, but we’re glad to have what we’ve got. Recommended. Joshua writes about a variety of topics, including video games, parenting, and, of course, Aldi. He's also a science fiction novelist. You can learn more about him at www.joshuaajohnston.com.